It looks like there is a little bit of product moving going on amongst the brands owned by parent company Black & Decker. 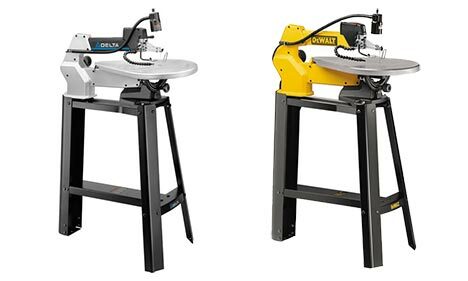 The very popular scroll saw that was once the DeWalt DW788, is now the (soon to be popular?) Delta 40-690. As far as specifications go the tools are exactly the same, but here is why the change is a good move for future scroll saw buyers. The Delta version of the saw comes with a 5 year warranty, while the DeWalt version comes with only a 3 year warranty. The move also makes sense for both brands. Delta is a brand that is known for their shop and woodworking tools, and DeWalt is a brand that is known for their contractor tools. The scroll saw is hardly a saw I would consider to be a contractor tool, and would be much better represented by the Delta name. So why was the saw under the DeWalt name to begin with? Because when the DW788 was first launched Delta was not yet owned by B&D; this would not take place until years later. It would be interesting to see if the country of origin has changed in any way because of the move. Suggested retail price for the 40-690 is $599 including stand (DW788 does not include stand). It would be interesting to see if the country of origin has changed in any way because of the move.